Eight Cornell undergraduates, representing the Engineers Without Borders-Cornell Student Chapter, traveled to Bolivia over summer break for a bridge-building project in a tiny village in the southwest corner of South America’s poorest nation. The team, led by mechanical engineering major Nathalie DeNey ’18, built a 165-foot-long suspension bridge made of concrete, steel cable and wood. The bridge spans the Vitichi River and connects the village of Calcha with its agricultural crops as well as a neighboring town – important particularly during the rainy season, when the river becomes dangerous to ford. 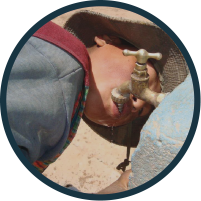 Over the two months, the team also built other things – relationships – that they hope will be just as enduring in the remote village, 200 miles south of the Bolivian capital city of La Paz. Other EWB-Cornell travel team members included mechanical engineering major Jonathan Mabuni ’16, environmental engineering major Susan McGrattan ’17, and civil engineering majors Joseph Ienna ’17, Meriel Engrand ’18, Mario Saldana ’18, Bethany Schull ’18 and Anna Sofia Montoya-Olsson ’19. Cornell began its affiliation with Engineers Without Borders during the 2011-12 academic year, and for the last two years has collaborated with Engineers In Action (EIA), a nonprofit based in the U.S. that provides logistical and other support to engineering teams traveling to Bolivia for projects such as Cornell’s bridge build. Rod Beadle, executive director of EIA and a registered professional civil engineer, said the work teams like Cornell’s EWB group perform is important for communities like Calcha, where 98 percent of the population lives on less than $2 a day, according to the EIA website. The team arrived in Bolivia in mid-June and got right to work, digging the foundations for the concrete anchors on both sides of the river, from which their bridge would be suspended. Most of that mixing was done by hand, until the team was able to run electricity from town to the Calcha side of the river. They borrowed a small cement mixer and were able to mix concrete for part of the project. McGrattan said a typical day included rising for breakfast at around 7:30 a.m., arriving at the work site at 8:30 or 9 and working till lunch at noon. Then after a siesta break, work would resume at 2 p.m. and last until 6. EWB-Cornell/Provided Nathalie DeNey ’18, bridge team lead for the Engineers Without Borders-Cornell chapter, puts her handprint on the side of one of the bridge towers. The completed bridge is in the background. Both DeNey and McGrattan said one of the biggest highlights of the project was installing the crossbeams onto the tensioned cables, prior to attaching the decking boards to the structure. Being suspended approximately 16 feet above the river, kicking crossbeams out onto the cables, “was amazing,” DeNey said. Both women said the most off-hours fun they had was on the Fourth of July. The group painted their faces red, white and blue and had a bonfire and s’mores. Their cook also did her best to make them feel at home, with her version of hamburgers. 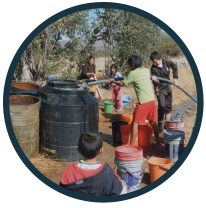 EWB-Cornell is returning to Bolivia next year for a water project, but neither DeNey nor McGrattan is planning on making that trip. They do, however, hope to get back to Calcha one day and see how their bridge has affected their new friends. Beadle said he’s impressed by student groups’ willingness to sacrifice a portion of their summer break to do meaningful work thousands of miles from home. And as most college groups spend just a week or two, he said, Cornell’s team deserves particular praise for devoting two months to their project.